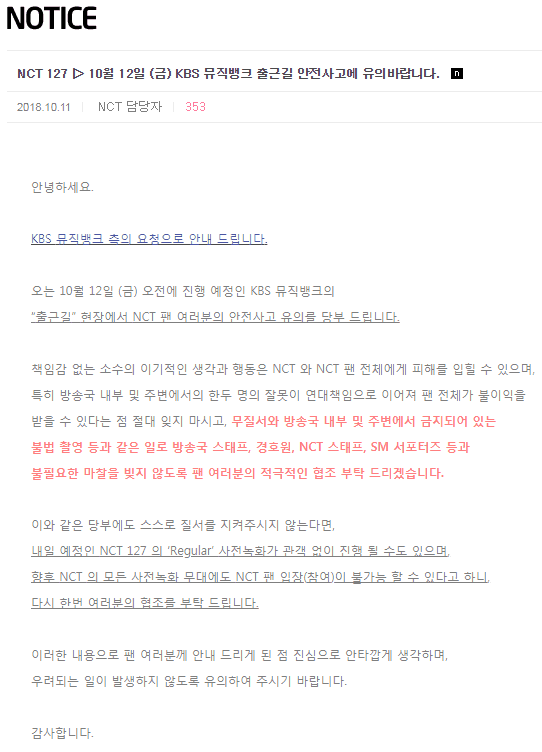 Recently a post on Pann is gathering attention from netizens for posting an official statement of KBS telling NCT’s fans to adjust their behavior. Regarding the thoughtless behavior of some NCT fans while the group was on their way to Music Bank on September 10th, the announcement made by KBS asked NCTzens to stop their act of pushing the staff and other people, as well as not to illegally film the idols. It also stated that if the fans can’t adjust themselves, NCT127‘s upcoming stage for “Regular,” or any performances done by the group from now on might be recorded without any audiences. [+89, -1] Look at how they crawled out from the fence. [+44, -0] They look like zombies.